- What would have happened if Willy Wonka gave his factory to August, Veruca, Violet or Mike? What changes would they make? Choose one of these characters and write a different ending of the film explaining what they did to the factory. 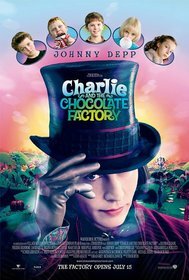 - Willy Wonka warns the children not to get lost in his Chocolate Factory. Imagine that one of the children wander off were they shouldn't. What will happen then? - If you were Charlie, would you keep the ticket or sell it? Why? - What happens in the Chocolate Factory when Charlie starts running it? What changes does he make? - What was your favorite part of the movie? Why? - BBC News has decided to interview all of the lucky winners before they go inside Willy Wonka's factory. Your task is to create an interview between BBC News reporter and a golden ticket winner.